It all started on the 17th day of May 1673. The journey, would travel from St. Ignace, Michigan to Green Bay, through the Fox, Wisconsin, Mississippi Rivers and back through the Illinois River and then back to Lake Michigan. This would change life forever as all the Native people knew for thousands of years earlier. With Father Jacques Marquette, Louis Jolliet and five other men in two birch bark canoes, left to explore unknown territories, eager to learn the passageway to the Mississippi River that what was thought, would flow to the west to California and beyond to the Orient. Father Marquette knowing six Native American dialects or languages, gave him a major advantage in meeting many Native Americans. The explorers traveled up the Fox River to the farthest outpost of any French trapper and missionary. It was where the people of the Fire Nation, the Mascoutin was present along with the Miami and Kickapoo, all speaking the Algonquin language. This major encampment of 3000 inhabitants, welcomed the Black Robe, Father Marquette, and the rest of the party. This landing is where the legend of the cross comes into happening. With an established place where French trappers, missionaries and Native Americans were all on friendly terms, a cross was planted across the river from Huckleberry Road. This area later became the Village of St. Marie near Princeton. Besides establishing a cross on the other side of the river, Father Marquette tasted some free flowing mineral water and blessed the natural springs, still running today. Louis Jolliet and Father Marquette made their way to a lookout point on top of Mt Tom Hill to get their bearings and to observe this whole region. On top of this hill, footings of large stones, plus a pile of similar stones were piled to hold a flag as a marker. Today, the stones are still present. The Society of Jesus the Jesuit Order of Catholic priests, taught these inhabitants, the Old World religion and prayer. For many generations, the Native Americans spoke of the Great Meeting of the man who wore the Black Robe and Catholics along with many other religious groups made a pilgrimage to this site. The arrival to this location was June 7, 1673. In order for the expedition to continue, the explorers needed some volunteer scouts from the Miami to help lead the way to the Mississippi. Scouts were needed to guide them through wide areas of wild oats as the French first called it, but it was wild rice. The wild rice grew so tall, for someone not knowing the true channel of water to take, would easily get lost in this natural maze. On June 10, 1673 the great explorers departed from this key location in order to find their gateway to the Mississippi River, to the new rich lands of great natural wealth and beauty. On June 17, 1673 the explorers found the Mississippi River at what is now Prairie du Chien the junction of the Wisconsin and Mississippi Rivers. The total journey covered over 2500 miles by canoe. With Jerry Disterhaft, whose family have been early pioneers themselves arriving in 1870, and Jerry’s family, Missy, Ryan and Terra helping with the research along with Kathy Weinberger and her brother Joe Wyse, all wanted to bring back to this area a replica of the original Cross and continue the Legend of the Cross. Glen Gorsuch and his son, Kerstin, Cole Nimphius part of the Neshkoro Boy Scouts, the Fox River Patriots 4-H and the rest of the Green Lake County 4-H Clubs are all helping restore the Cross, to its rightful location along with making a board walkway to the Holy Springs, a true hidden priceless treasure. Thanks to Cliff Mashuda Sr, allowing this landmark to come back to the historic location on his land. 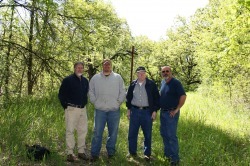 In the Fall of 2005, Cliff Mashuda Sr, Ed Wargula, who as a boy remembered seeing the Cross as he went fishing (50 to 60 years ago), and Jerry Disterhaft all went to explore and find where the Holy Springs were located and where the Cross once stood. Thanks to Paul Buchen, for cutting the steel beams used for the footings for the Cross. The importance of this happening and preserving will be beneficial to this local area youth and adults and to the whole State of Wisconsin. Thanks to Cliff’s relatives who were the first families to restore this historical site. Stanley Bartol moved onto the farm homestead in 1875 and allowed Martin Manthey to make the first replica of the Cross and establish it near the Holy Springs in 1892. Then as Stanley Bartol’s daughter married Stanley Mashuda, the site stayed in the Mashuda family and preserved to today’s date.the Cross, to its rightful location along with making a board walkway to the Holy Springs, a true hidden priceless treasure.